Duncanville Mobile Auto Repair is here to get you back on the road fast! The fact that we are mobile means that we can save you money by keeping our overhead low, also you get to avoid towing charges, and you don’t have to wait in the mechanic’s waiting room! Our primary goal whenever we do any mobile auto repair is complete customer satisfaction. We want to make sure that your car, truck, or van keeps running like the day you bought it or better. We are ASE certified mechanics to give you the confidence that we have the training, knowledge, and tools to do many types of on site mobile auto repairs. If you are having a problem with your car that won’t start, it is likely an electrical problem or a fuel problem. Assuming that you have gas in your vehicle, if it is a fuel issue, likely culprits are the fuel pump or fuel filter. The most common electrical issues are a dead battery, a bad starter or faulty alternator. Luckily we can diagnose and fix all these problems and more on site. To fix only what needs to be fixed and to make recommendations of any additional preventative maintenance on anything we see may become a problem shortly. Of coarse any auto repair is always your choice. 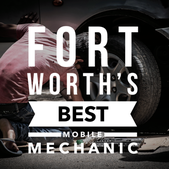 Duncanville Mobile Mechanic : 682-847-7898 Mobile Mechanic Duncanville, TX.